In the most recent issue of the British Reader’s Digest, Professor Julian Savulescu argues that parents may have a moral obligation to genetically engineer babies with more ethical traits. 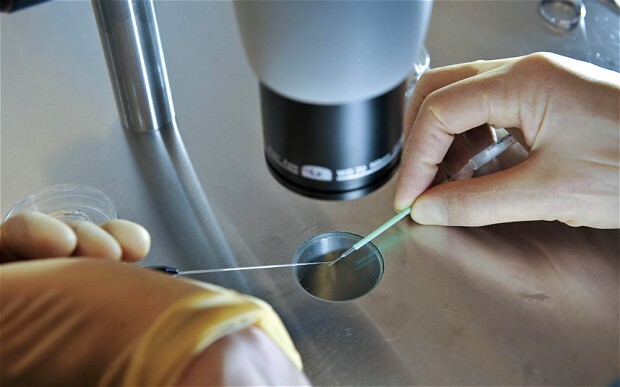 With the advances in medical technology and genetic screening, Savulescu believes that couples can use genetic mapping of embryos in combination with in-vitro fertilization (IVF) to ensure that their children do not exhibit traits that may be harmful to themselves and others. Modern eugenics, from testing for diseases to deciding whether you want a girl or boy, is voluntary. So where genetic selection aims to bring out a trait that clearly benefits an individual and society, we should allow parents the choice. To do otherwise is to consign those who come after us to the ball and chain of our squeamishness and irrationality. Notice his language here. He believes that squeamishness and irrationality (admittedly traits found in many humans for the entire history of mankind) are a “ball and chain” on society. Such undesirable traits apparently prevent progress for the human race. Within his worldview, progress seems to be the ultimate goal. He never really defines progress apart from an ethic of non-malevolence. As long as people are not harming themselves or others, Savulescu seems to be satisfied. Another commitment that seems evident in this proposal for genetic engineering is the idea of genetic determinism. This is the concept that man is simply a collection of genetic material. His personality, intelligence, relationships, etc., are determined completely by his genetic makeup. If this genetic makeup could be altered or enhanced, then we could generate a race of superior individuals. Even though Savulescu would not go so far as to say that we are required to take part in this genetic manipulation, he does believe we have a moral obligation to do so. Philosophically, therefore, Francis Crick is a reductionist—that is, one who would reduce man from a complex personal being made in the image of God to an electro-chemical machine. Unfortunately, such a notion not only makes man meaningless but soon leads to the idea that man can, and just as well may, be manipulated with impunity. Screening embryos like this is illegal at present, but isn’t rational design something we should welcome? If we have the power to intervene in the nature of our offspring—rather than consigning them to the natural lottery—then we should. Surely trying to ensure that your children have the best, or a good enough, opportunity for a great life is responsible parenting? We need to recognize with Schaeffer that man is a complex personal being made in the image of God (Gen 1:27). We are more than DNA and chemical bonds. We have souls. And despite Savulescu’s praise for technology, genetic engineering cannot undo the effects of the fall (Gen 3). We are sinners. We often act in opposition to our own rational thought. We seek after our own desires—many times to the detriment of others and ourselves. Genetic screening will not solve this problem. Only Christ conquers sin. Julian Savulescu, “The Maverick: ‘It’s Our Duty to Have Designer Babies,’” Reader’s Digest (British edition), August 21, 2012. Richard Alleyne, “Genetically engineering ‘ethical’ babies is a moral obligation, says Oxford professor,” The Telegraph, August 16, 2012. Francis A. Schaeffer, Back to Freedom and Dignity, in vol. 1 of The Complete Works of Francis A. Schaeffer (Wheaton: Crossway, 1985). Curious to watch a man reduces ethics to chromosomes, claim an ethical reason for screening out unethical chromosomes. If ethics is simply a matter of DNA, then ethics is a fraud. There is no right or wrong; just programming by a very mischievous God/Cosmos/Advanced Alien Race/Etc. Perhaps there are some people – people with majorly messed up genetics – who should avoid procreating. But in the big picture, selective breeding will do to us exactly what it has done to “pure bred” dogs: thin the gene pool. They have all sorts of medical problems, and most would not stand a chance against the typical mutt in the wild. What I’m saying is, variety is necessary to the survival of our race. You have made an astute assessment of his logic. It is irrational to make an argument for ethics on the basis of DNA that already programs our ethical ideas. I don’t think Savulescu recognizes that glaring problem with his argument. Thanks for stopping by, Lyric.